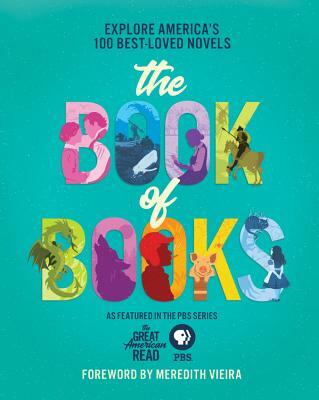 A blockbuster illustrated book that captures what Americans love to read, The Great American Read: The Book of Books is the gorgeously-produced companion book to PBS's ambitious summer 2018 series. What are America's best-loved novels? PBS will launch The Great American Read series with a 2-hour special in May 2018 revealing America's 100 best-loved novels, determined by a rigorous national survey. Subsequent episodes will air in September and October. Celebrities and everyday Americans will champion their favorite novel and in the finale in late October, America's #1 best-loved novel will be revealed. The Great American Read: The Book of Books will present all 100 novels with fascinating information about each book, author profiles, a snapshot of the novel's social relevance, film or television adaptations, other books and writings by the author, and little-known facts. Also included are themed articles about banned books, the most influential book illustrators, reading recommendations, the best first-lines in literature, and more. PBS, with nearly 350 member stations, offers all Americans the opportunity to explore new ideas and new worlds through television and digital content. Each month, PBS reaches nearly 100 million people through television and nearly 28 million people online, inviting them to experience the worlds of science, history, nature and public affairs; to hear diverse viewpoints; and to take front row seats to world-class drama and performances. PBS' broad array of programs has been consistently honored by the industry's most coveted award competitions.